As for toxicity, the most toxic solution for medaka larvae (as judged by % mortality over the course of several days exposure to the solutions normalized by the concentration of Fe atoms) is the soluble Fe(II) solution. The second- and third-most are the CMC-nZVI and nZVI solutions, respectively, with nFe3O4 showing little toxicity. It is noteworthy that the ‘stabilized’ particles are more toxic than the ‘non-stabilized’ particles to the larvae. 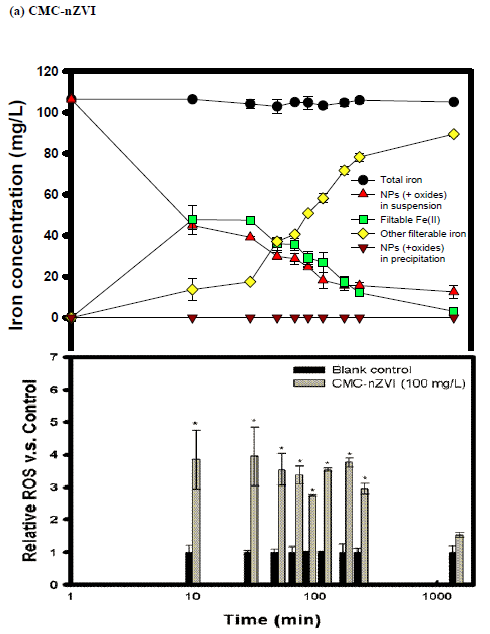 In contrast, the order of bioaccumulation was nFe3O4 > nZVI > CMC-nZVI ~ Fe(II) (as measured by BCF or bioconcentration factor = iron concentrated in larvae / measured total iron concentration of the dosing solution). This order, interestingly, is the opposite of the toxicity order displayed above. With these results, the researchers then investigated the molecular effects of the dosing solutions. Though the study is very detailed and worth reading more closely, the most dramatic effect was of CMC-nZVI on the expression of superoxide dismutase (SOD), one of nature’s enzymatic responses to oxidative stress, which increases approximately four-fold in the presence of CMC-nZVI. They also studied the effects of the dosing solutions on the gene expression of the antioxidant enzymes catalase (CAT, which catalyzes the decomposition of hydrogen peroxide) and glutathione S transferase (GST, which catalyzes the transfer of reduced glutathione groups to electrophiles), though the changes in expression were less significant than for SOD. The source of the differing impact on expression of the different enzymes is not clear to me, but I’m not shocked the genetic response is more complicated than a simple increase in gene expression in the presence of oxidative stress. The researchers next studied the effects of the solutions on the activities of the enzymes. For CMC-nZVI there is little effect on the actual activity of SOD over seven days of exposure. This indicates that while CMC-nZVI has dramatic effects on gene expression it has no effect on the activity of the proteins coded by those genes. Furthermore, the intracellular ROS also is not affected by exposure to either CMC-nZVI or nZVI, suggesting the balance of active antioxidants can handle the oxidative stress from ROS at least over the course of several days. In summary then, the NP toxicity appears due to a combination of hypoxia, the release of Fe(II), and other “NP-specific toxicity”. If true, the context of the application of these NPs – which are used for remediation in both aquifers and soils – then becomes important. For instance, the release of soluble Fe(II) would probably be of higher concern in an aqueous environment than in sediment. Moreover, the transport of particles between aquifers and sediments, especially in light of the dynamic nature of these solutions, needs to be investigated. 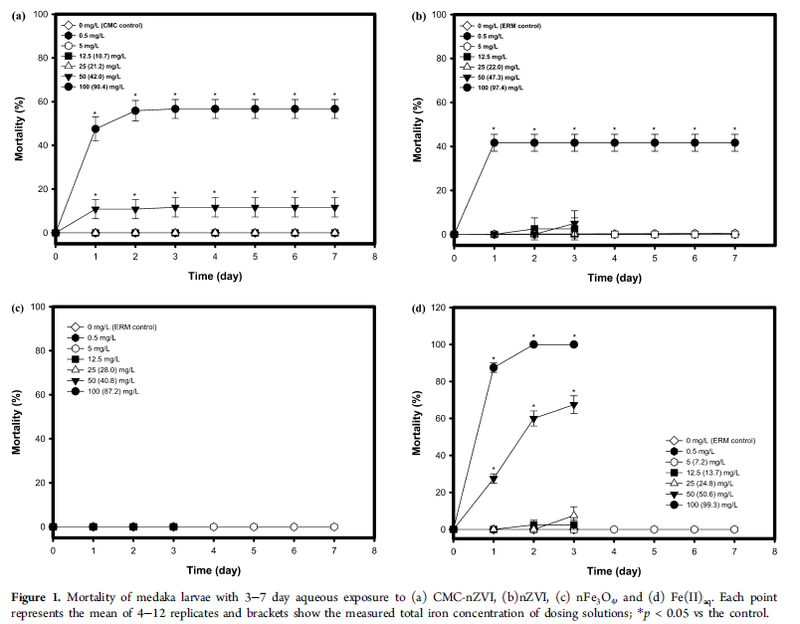 Going forward, I am interested in the identification and description of the NP-specific modes of toxicity and how that differs with stabilization, as the CMC-nZVI solutions are more toxic than the non-stabilized ones to medaka larvae. NP stabilization with surface ligands is a common method to prevent aggregation, but, at least in this case, also increase their toxicity via the release and dissolution of surface accessible iron atoms upon oxidation. By tmckeagberkeleyedu in Toxicology on August 15, 2012 . Julian, I’m interested in their BCF measurements. Given that the denominator is the total iron concentration in their dosing solutions, do you know whether they accounted for any iron nanoparticles that were sedimented (and therefore not “in solution”)? If not, this would strongly skew the results such that the more suspendable particles have higher iron concentrations in solution and therefore lower BCF values. Good question. Looking at the supplementary info, total iron concentration was measured for all of the iron in the sample, soluble,suspended, or precipitated. They digested the sample in 1M HCl and used a colorimetric method to quantify the total iron. It seems to me that this collection of this data shows that there is no “NP” specific toxicity, and that all of these results follow from understanding the iron oxidation chemistry. In the process of oxidizing metallic iron, ROS and free Fe2+ are formed, these are the two toxic species that act to trigger the described biological responses. In my mind the discrepancy between the CMC coated and uncoated iron particles can be explained by the likely difference in oxidation of the starting material. Without a protective coating I would guess that the uncoated particles are more oxidized and therefore less able to release ROS and/or Fe2+. Some coating are toxic on there own, and I think this is a good area for further research, but other people have shown the charged coatings (especially positively charged) pose a greater hazard. I think this is a case where the particles are relatively safe especially since the biological response was able to mitigate the harmful effects of ROS generation. Your analysis seems solid to me! The authors of the paper did mention that the particles can attach to the gills of the medaka larvae which I guess is specific to NPs (rather than soluble ROS or Fe(II)). In addition, they state that ‘aggregated forms of iron NPs may look like food to the fish’, which though not implying toxicity would be a concern specific to NPs. Not much I know, but I don’t want to misrepresent the paper which has a pretty intimidating discussion section! Thanks for reading!